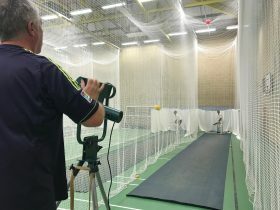 It’s that time of year when seasoned players shake off the Christmas excess and get back to it, whilst we hope that new players come along to help pick up the slack. Our net sessions (and our team) are open to people of all ages, abilities, genders and waist size, so come along if you fancy giving it a try. We have a bowling machine (AKA Doris) and all equipment is provided. Our Sunday venue has changed this year to North Leamington School,Sandy Lane, Blackdown, Leamington Spa, CV32 6RD. 10.30am until 12.00. Our Monday night venue remains Kenilworth Wardens, Glasshouse Lane,Kenilworth, CV8 2AL. 8pm until 9.30pm.